A half a century old, the grumpy duck is! Fifty years ago. All the way back in 1947 Carl Barks wrote and drew a story called "Christmas on Bear Mountain" in Donald Duck comics. Dell Comics actually published it in "Donald Duck #178". It marked the first appearance of Scrooge McDuck of the Scottish clan of McDucks. He didn't have all the familiar personality quirks that we would come to love, but the core idea was there. The story follows Donald, broke and unable to buy any gifts for his family. He gets a surprise invitation to his Uncle Scrooge's mansion way up on Bear Mountain. Scrooge has sent for his nephew so that he can test his character. He plans on scaring Donald by dressing up as a bear. But nothing in life happens as planned and a baby bear wanders into the living room while they're out and falls asleep beside the warm hearth of the fire place. Hilarity ensues and through a series of unintended consequences Scrooge believes that Donald has past his test and comes the next day to have Christmas with them. Carl Barks never intended on using the character for other than that one issue, but he soon realized the fun he could have with ole' Scrooge McDuck and the rest is history. If you get a chance to find a copy of Donald Duck # 178, don't hesitate. It's a great story with wonderfully rendered Barks artwork. If you've ever read any of Don Rosa's work you'll notice he pays tribute to Barks tales, particularly "Bear Mountain" in his enormously entertaining stories. So as you gather round to celebrate the holidays this week, remember that another thing we have to be thankful for is that rich, old Scrooge McDuck and the three cubic acres of wealth in his Money Bin. He looks pretty good for fifty, doesn't he? Scrooge is my favorite of the original Disney gang too (I like him much more than Mickey). 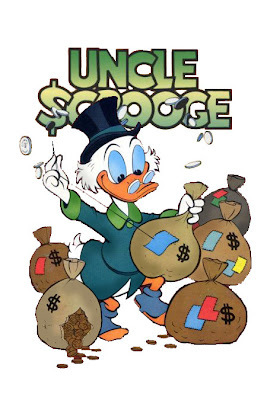 My favorite Disney character is Donald, but as far as the comics go, it's Uncle Scrooge, unquestionably. Was watching CNN while stuck in an airport in Brussels last week and they showed a poll for the best known fictional billionaire and Scrooge was number 1! This was an international poll I am assuming since it was playing in Brussels but isn't it just amazing how much influence this character has had. How many other "fictional" billionaires are there? Haha Honor - I usually make the same distinction. Donald is my favorite overall, Scrooge is my favorite in the world of the comics. As to Scrooge being the #1 billionaire in Brussels, remember that the duck books are much bigger in Europe than they are here. Interesting note about Scrooge - he is voiced by the same actor who played Wilbur Post on the old tv series Mr Ed! The actor is Alan Young. Had the previlege to meet him briefly in 1999. Very friendly person. He played Scrooge in "Mickey's Christmas Carol" as well as "Ducktales".